by Catalina Pradilla from team Inspiring Inequalities. I started my whole soccer dedication when proving myself to the boys at school. I was 7 years old and back then in Colombia playing soccer as a girl was not truly accepted. Every break I went to the boys and ask them if I could play. Receiving the same answer; "No, because you are a girl". Until one day I decided to tell them that I was good, asking them to let me prove to them that I too could play soccer. And so, they let me play. And I scored. This made the goalkeeper cry, humiliated that he lost against a girl. But I won the respect of the co-creators of the game, because I was wearing my self-respect around my neck. Since that day I continued to play every day. The driving force to just play the game was the one thing now connecting our innocence, aligning it with our passion. Disregarding of the gender inequalities. Sometimes we didn’t even have a ball, so we played with soda cans hearing our imaginary crowd cheering when we scored and cheering louder when we run around celebrating our creations. It was not until I moved to Sweden a couple of years later that I was able to play in a real girl and woman’s team. And for many years thereafter, I continued dedicated to my passion and dedicating my passion to the game. I often say that the end is always at the beginning. In 2012 I stopped my soccer carrier to travel for what became almost two years around the world. But you see the last time I played in a soccer game as the soccer player I still was, was in Melbourne, Australia, during this world trekking. I was alone walking underneath a burning sun in a park, when I stumbled into a soccer field where a game was on. And so, my passion for soccer told me once again one thing; stay. And play. Only men were playing, and I watched the game until half time to asked them if I could play too. When I asked they looked at me and then at each other, unsure if I knew how to play because I was a woman. Will I be able to stand strong against their body strength, winning a fight? Will I be able to pass the ball? Shout a long ball? Attack and Defend? Eventually I broke the silence. "I know how to play, can I join?”, I said. And it is here proving ourselves always will be worth it. Standing strong winning the fight for the ball with the strength that I owned, defending my team or saving the ball from the lines with the slides that I courageously made, attacking with the speed that I built, passing the ball with the skills that I practiced. And so, suddenly innocence aligned with the passion for the game once again connecting us all. The beginning and the end of this soccer journey was not only the unawareness of the potential of humanity, nor the gender inequalities. But it was also the courage and the light from the awakening of the capacity, the unlimitless and the potential of our being and our becoming. So why not prove ourselves until we don't have to anymore? Understanding that courage and light was all that was needed. To trigger humbleness in others, almost surrendering to the innocence born not from society but the innocence born from the pureness within us all. The mind can many times block the heart. But it did not block mine. 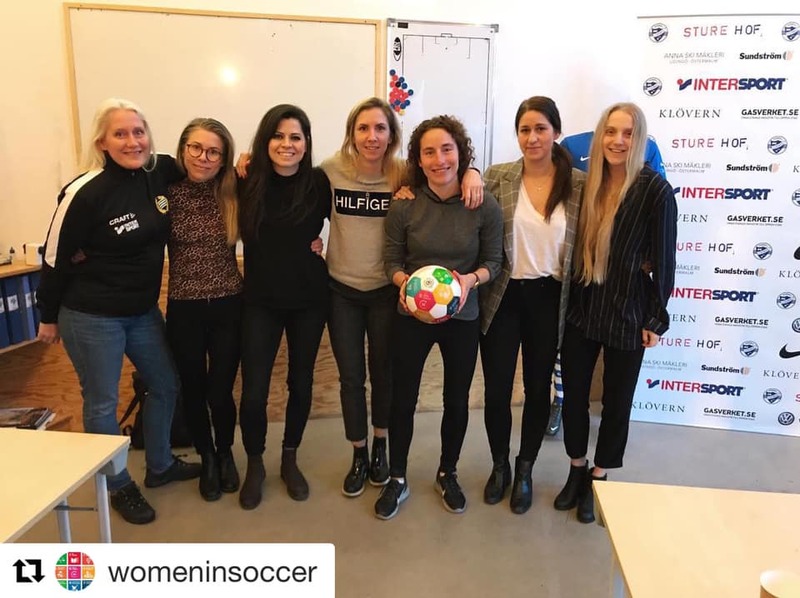 Please follow the team on Instagram at @womeninsoccer and join the Facebook group “Women in Soccer”. What I am trying to say is that sometimes in order to change the way the ones that are not the co-creators of the game think, we have to change the way they feel. Inspire, transpire, prove, show and be. It is all a collateral beauty that starts within me as it starts within you. Image then, if we bring a portion of us to women in soccer, to the gender inequalities, to this world, and change it for the better. Because we can. Proving what you teach, and learn from yourself as from others, proving what you believe in, by spreading it, forcing it to transpire in as many situations as you can. Remembering always to inspire and transpire through the light of you, not through the darkness of smallminded minds and closed spirits and hearts. When you understand the value of what that is, the energy goes up. As a player you will elevate, as a coach you will elevate, as a person you will elevate, creating some type of domino effect. When Louise Schillgard spoke about her achievements in Sollentuna FK Dam/Flick, that’s another proof right there of that same domino effect. Guiding young players to understand what they as individuals want. Guiding them to understand what they as individuals need to achieve what they want. Or when Jackie Bachteler spoke about the purpose of every practice, the purpose of every motion. How the purpose of the details can impact so mighty the journey of growth in women’s soccer, and how the mental strength can contribute to our courage. That’s proof right there of what it truly means to be watered, inspired and guided by the great minds and great leaders to eventually become our own water, to water the blossom that we own. Becoming the great minds and the great leaders of our self-worth, of our capacity. And teach, inspire, guide and transpire the potential of our greatness, finding the capacity of our own potential, to demand a change and reduce the inequalities in each women’s soccer environment. 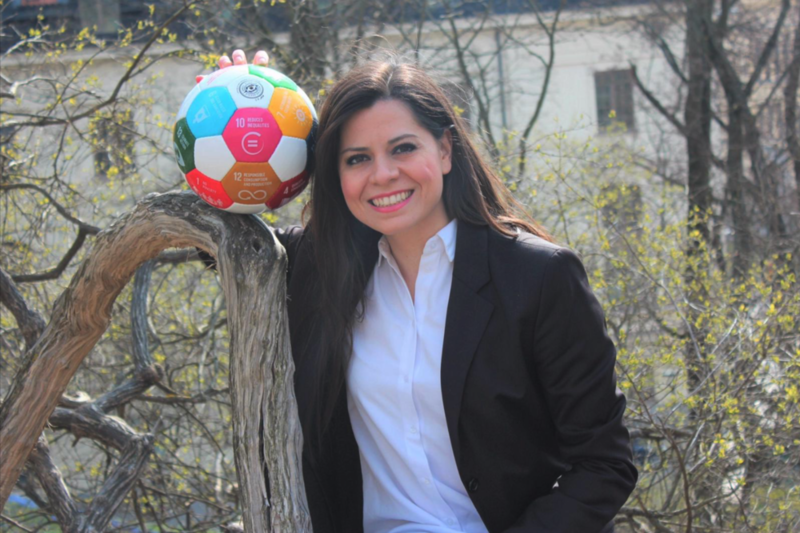 Catalina is one of the EU team members playing on team Inspiring Inequalities lead by coach Jackie Bachteler selected as part of the special ErasmusPlus project here and read more about Jackie here. The players on the teams are a new kind of sports stars and role models. They have all had to overcome social or cultural barriers to participate in sport. They will help us better understand what it takes to engage more women in sport, and make them feel like they belong. They are our experts.